It is World Password Day. Held on the first Thursday of May each year, this awareness day was started as a way to bring attention to good password hygiene and practices. In the face of recent high-profile data breaches and privacy blunders, the need for better password practices is much needed. The number of breaches in the U.S. since 2011 has grown from 419 to 1,579, an increase of 277%. The reality is that almost all American adults’ (not to mention a disturbing number of children’s) personal information is now available on the dark web for sale. Our personal information is no longer personal. Along with the global volume of compromised data, crime rings and nation states are getting more aggressive and sophisticated in perpetuating identity fraud at a large scale. There is much at stake for consumers and businesses alike and advocating for strong identity verification practices is fundamental. Americans appear to understand this need in the post breach world we live in. According to the Consumer Digital Identity Survey (conducted by IDology this year), 57% of online adults state they are more concerned about their personal information being compromised from a data breach compared to last year. Yet that heightened concern doesn’t seem to have resulted in better password practices. 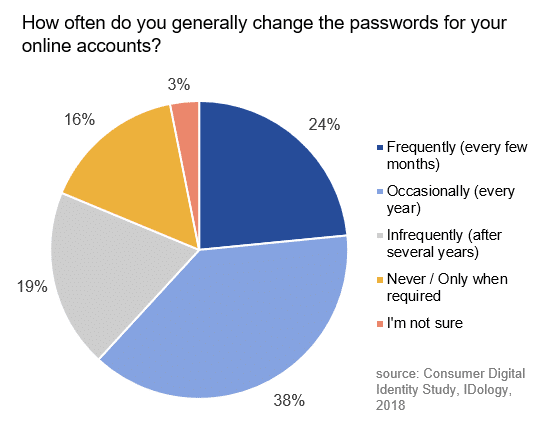 Disturbingly, 44% write their passwords down and 43% use the same passwords across accounts or with only slight variations. Even among consumers who have been impacted by a data breach, only 40% have changed their passwords since being notified. It is not all bad news however. Seventy-nine percent of online American adults are open to using authentication methods other than passwords, if they are perceived to be easier and safer. And with 59% stating a “strong” belief that it is their personal responsibility to protect their own personal information, perhaps education and a little time will push safer practices to wider adoption. We have entered into a new era in digital identity verification and authentication. Employing comprehensive, multi-layered identity verification that is both frictionless and secure is table stakes. Offering and evangelizing digital security best practices to customers and employees can go a long way to ensuring safe and effortless commerce. And that’s worth celebrating. If you’re interested in how IDology’s best in class technology coupled with cross-industry consortium data intelligence can locate, process and convert more legitimate customers without friction then contact us for an expert consultation today. 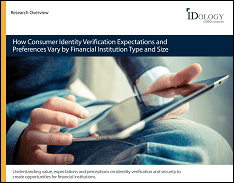 And look for IDology’s upcoming report, Consumer Digital Identity, to learn more about what consumers expect and desire in today’s new era of identity verification, privacy, and trust.